One of the first cookbooks I bought after going vegan many years ago was by Nava Atlas, and I cooked from it often at the time. Flash-forward to present day and my Ikea Billy Bookcase is now jammed packed with vegan cookbooks. My most recently acquired cookbook was also written by Nava Atlas, and like the first book, I’ve been cooking from it often. While I love all of the books Nava has written in the interim, I am slightly jealous of the newly vegan who now have Plant Power: Transform Your Kitchen, Plate, and Life with More Than 150 Fresh and Flavorful Vegan Recipes to help them with their transition. Plant Power is packed with tons of tips on how to transition to plant-based eating, and it’s full of delicious, yet simple recipes. It focuses on the basics, from setting up a plant-powered pantry and fridge to choosing the best fresh foods for each season and streamlining daily meal preparation. Plant Power is divided into two sections. Part one focuses on plant-powered living with nutrition information, tips for setting up a vegan pantry, meal planning strategies, shopping for veggies, and much, much more. There’s practically advice on dealing with family who aren’t vegan yet, and how to get kids to eat more veggies. Nava also shares her own plant-powered journey and dispels some of the myths that surround vegan diets. If you have any questions about a vegan diet or lifestyle, you’ll find the answers here. 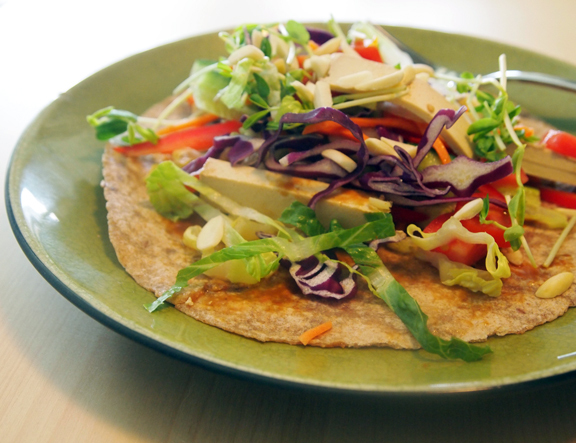 The second part of Plant Power is where you’ll find all of Nava’s delicious recipes. These aren’t recipes that will keep you in the kitchen for hours on end. On a recent edition Victoria Moran’s Main Street Vegan Radio Nava said she wrote the recipes in this book for busy people who want a good meal after a long day at work and don’t want to spend a lot of time making it. The recipes are easy to make, don’t take much time, and don’t require hard-to-find ingredients. They’re also highly flexible. Nava includes variations and substitutions for many of the recipes. She also includes “Complete the Meal” suggestions for most of the recipes, to help you with side dish ideas. Homemade sauce recipes such as barbecue sauce and cashew sour cream are included, but Nava suggests using store-bought if you’re pressed for time or just don’t feel like making your own. 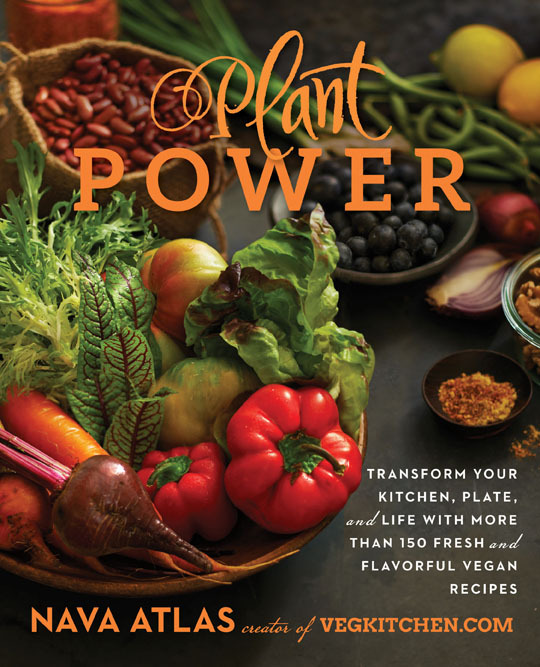 The cover says there are more than 150 recipes in Plant Power, but it seems like much, much more to me. If you include all of the variations, you could probably cook from this book every day for a year and never make the same thing twice. I made a few of the really simple dishes in Plant Power recently, and they were all incredibly delicious. 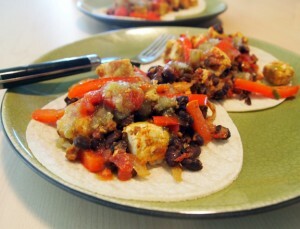 I stared with Tofu and Black Bean Rancherous for breakfast. This is similar to a recipe Nava had in Vegetarian Times several years ago, so I already knew I would love it. And I did! From there I went to the Fully Loaded Emergency Nachos, and I made Nava’s cashew sour cream to go with them. The recipe header says this dish is called “emergency” nachos because it’s a “last bastion of hope before you reach for the take out menu”, but I thought it was more of a “stop everything and make these nachos!”, because they’re so good. 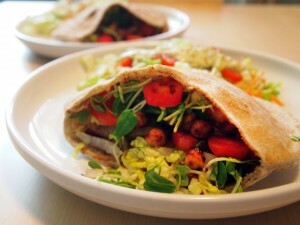 I’ve also made a few of the sandwiches, including the Barbecue-Flavored Chickpea Sandwiches and the Thai-Flavored Salad Wraps. I have a lot of pages bookmarked, and I plan on doing a lot more Plant Power cooking. 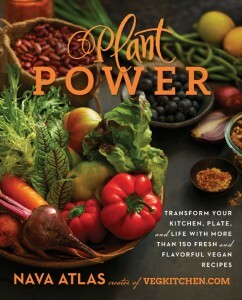 Plant Power is a gorgeous hardcover book full of mouthwatering photos taken by Hannah Kaminsky. Even if you’re a vegan veteran like me, you’ll want this book for it’s delicious, no-fuss recipes, and you’ll want to keep it out on your coffee table, rather than relegate it to bookcase with your other cookbooks. Chic Vegan readers are in luck, because we have a copy of the book for one lucky reader. Follow the instructions below to enter. US and Canadian residents only, please. Contest ends at midnight eastern time on Sunday, September 28. Good luck! Nava is SUCH a legend! Would love to win this! Tofu scramble! with lots of peppers and onions. Tofu quiche! I’ve been making it since I was a vegetarian years ago. My go-to plant dish is pan fried chickpeas with veggies and rice. anything involving chickpeas and roasted veggies! Some take on a taco- there are so many versatile and delicious kinds! 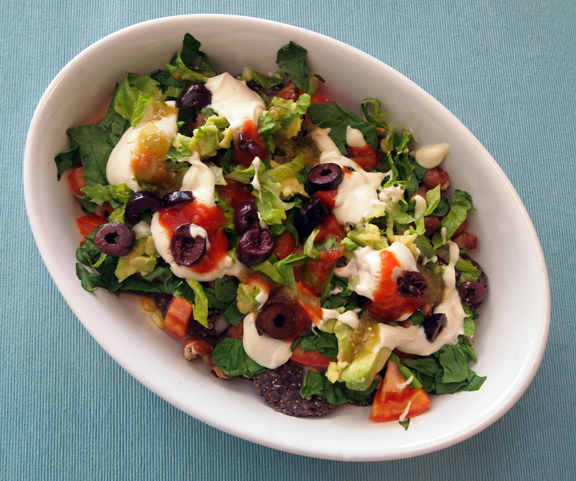 Taco salad, we had it tonight! When the weather gets cool and squash and pumpkins are everywhere at the farmers market I love to make butternut squash soup, so warming and delicious. Wheat spaghetti with side salad is our quick and easy. 3 bean chili is my slow and easy. This looks like an amazing recipe book! I love Nava’s books. Wild about Greens is a go to book in our kitchen. I love Nava Atlas and her recipes. Would love to win this! But I’d gladly settle for the cookbook! Right now, I’m obsessed with quinoa salad. Chili’s also a go-to for me. Peanut Noodles with Stir-Fried Veg and Tofu makes a frequent appearance at my house. It’s the hubs favorite. Thanks for the giveaway! Struggling to attain a fully vegan diet, some easy bean curry dishes or one of Nava’s soups help keep me on the right path. A one-pot mix of freekah, beans, and veggies! Noodles with peanut or sesame sauce, veggies, tofu and a sprinkling of nuts! Would love to win this! Looking for some new recipes, for sure. Quinoa-based spaghetti with marinara sauce loaded with veggies. My go-to plant-based meal is roasted veggies. For a quick and easy dinner, I throw a bunch of veggies, squash or sweet potato and some tempeh or tofu into the oven and let them cook while I get other things done. As soon as they turn golden and begin to caramelize, my meal is ready. So simple, but so delicious! Tofu and veggie stir fry is another favorite of mine. The slowest part is the chopping! Kale salad with avocado, cranberries and pecans! Fav plant-powered recipe is simple fresh pressed juice! Instant energy!!! Spicy asian noodle salad with lots of fresh veggies. Rice, edamame, leafy greens, pepper, lemon juice and nutritional yeast. A hearty salad with a bed of greens, sprinkle of quinoa, beans, lots of colorful veggies, topped with avocado, chopped almonds and a dusting of nutritional yeast. For a hot meal I stay pretty basic with brown rice and pressure cooked beans topped with fresh salsa, avocado, red onion and if I’m really stepping it up some organic tortilla chips. My go to recipe is a veggie and tofu curry. I absolutely love veggie lasagna and veggie chili! Brown rice, baked tofu, and frozen vegetables. So quick and easy! Love roasted vegetables! Top with coconut aminos. Love seasoned quinoa with shredded sautéed kale in steamed corn tortillas topped with avocado and salsa.